The Mehbooba Mufti government of Jammu and Kashmir fell two days ago after the Bharatiya Janata Party withdrew from the coalition. As per the law, Governor NN Vohra has now taken charge of the state. The Modi government and BJP often surprise the media by its sudden, unexpected moves. The fall of the government in J&K was another such move. While the media and former ‘power brokers’ were kept guessing and scratching their heads, the state of Jammu and Kashmir has been brought under President’s rule. A number of high profile appointments have been made in the state, one name that stands apart and has left many power players unnerved is that of IPS officer K Vijay Kumar. 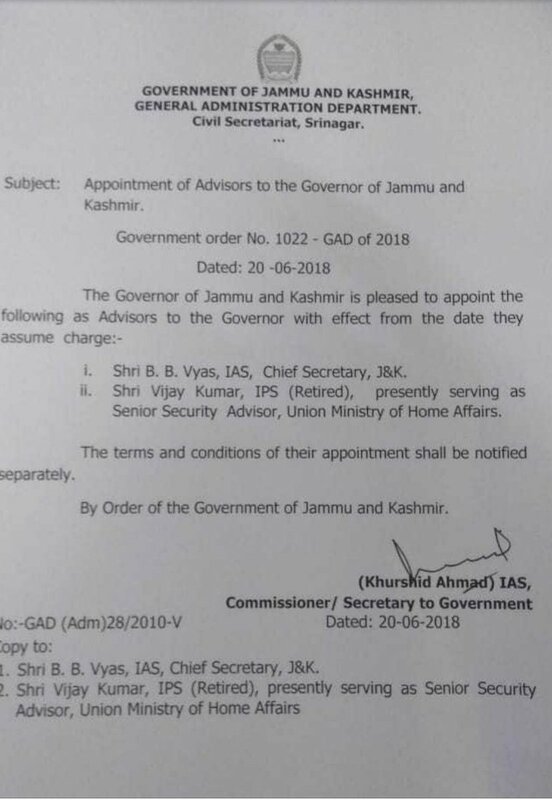 K Vijay Kumar has been appointed as the advisor to the governor. Here are some interesting facts about one of the most sought-after officers in India. K Vijay Kumar is a 1975 batch IPS officer. He holds extensive experience in Jungle warfare, security detailing and counter-insurgency. He had served in the SPG security details of Rajiv Gandhi, he was moved from Rajiv Gandhi’s security team a year before his assassination and was appointed as the head of SPG to protect J Jayalalitha. He is not new to Jammu and Kashmir. In 1998, he was appointed as IG, operations of BSF in the state. In 2004, he was appointed to head the Special Task Force ‘Operation Cocoon’ to hunt down Veerappan. Veerappan was wanted for the killings of almost 184 people, mostly police officers and for almost a decade, he had terrorized 3 state governments and paramilitary forces. He smuggled sandalwood and ivory and even maintained an army of armed bandits. The state governments of Karnataka and Tamil Nadu were struggling to nab Veerappan for more than a decade. The operations were one of the costliest in the History of India and are believed to have cost more than 1 billion. Soon after K Vijay Kumar’s appointment, Veerappan was killed on 18 October 2004. He was the head of the National Police Academy in Hyderabad. In 2010, he was appointed the Director General of CRPF. He has studied the Naxal and Maoist operations extensively and was appointed by the Ministry of Home Affairs as the senior security advisor in 2012. He was tasked with the revision of India’s anti-Naxal policy after 26 CRPF men were martyred in a Maoist attack in Sukma. He had stressed over road constructions and better tactics adaptations by CRPF during extensive operations against Naxals. He is one of the main motivators behind the success of CRPF in recent times against Naxals in Bastar region. K Vijay Kumar is a sharpshooter and fitness enthusiast. He is also a voracious reader. During his two years as the Police Commissioner of Chennai in 2001-2003, Chennai saw many encounters where many of the city’s mafia dons were gunned down. When criticised by human rights activists, his reply was, ” Policemen do not carry guns as ornaments”. K Vijay Kumar is the author of the book ‘Veerappan, Chasing the Brigand’. He completed his tenure in the Ministry of Home Affairs on June 12. With his extensive experience in dealing with Naxals, bandits and his legendary go-getter attitude, this decorated police officer is expected to bring out some major achievements for the government in the terrorist-infested state of Jammu and Kashmir.